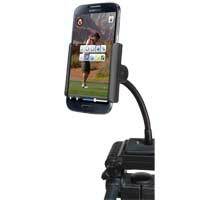 Easily mount your smartphone or point and shoot digital camera on a tripod. Use it with a self timer, record a video, FaceTime call, or any app that requires handsfree convenience. Top clamp is spring loaded for easy insertion/removal. This patented mount fits all iPhones/iPod touch models and most smartphones from 2.2"" to 2.8"" wide. Phone, camera, and tripod not included.